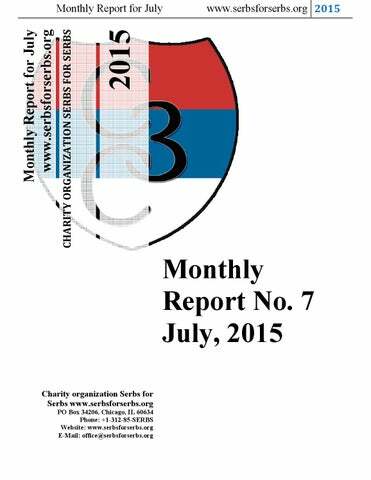 Monthly Report for July Dear friends and donors, Charity organization Serbs for Serbs registered in the state of Illinois in United States in Jun 2010 by the group of the Serbian youth. Charity organization Serbs for Serbs is a 501(c)(3) notfor-profit charitable organization. Donation is tax-deductible to the extent followed by the law. On 30th September, 2011 we finally got the letter from department of the treasury (IRS) with tax exempt 501(c)3 approval. All donations to our organization donated from June 16, 2010 are tax deductible under section 170 of the Code. We are also qualified to receive tax deductible bequests, devises, transfers of gifts under section 2055, 2106 or 2522 of the Code. www.serbsforserbs.org 2015 the population and generally bad economic condition of the households in Serbia, Republic of Srpska and other countries in the Balkan. An average couple has "fallen" on one child. Analysts warn that Serbs will become a minority in its own country in the following century if the nation, individuals and government don't wake up from the nescient in which they've fallen! On the other hand, nobody is talking about the families with many children which grieve by living in bitter poverty. Occupied by their everyday struggle for survival, they are being humbly in their desire for implementing rights which belong to them. Their life stories, fears and problems are identical, but almost invisible and unheard in order to gain the attention of the public, media and even state. That's why the idea of the Charity organization Serbs for Serbs arose. The organization was formed by a group of young and trustful people, who are united by the common vision of helping families blessed by many children and who are aware of the fact that even a small help means a lot for those who don't live in a material excess. We are united by the humane idea to help the poorest part of the Serbian nation. Charity organization Serbs for Serbs try to revive the spiritless energy of the Serbian Diaspora which would be able to reinforce people of Serbian heritage as well as all good people throughout the world with minimal, but constant monthly donations. We hope and believe that there is also a grain of doing good and that you will join us in the endless struggle against poverty. God bless and save all Serbian families with many children and our honored donors who participate in the noble effort to return smile on children faces. Our mission The mission of Charity organization Serbs for Serbs is to affect on consciousness of Serbian people through our projects and humanitarian activities, in order to develop better society for future generations. Why Serbs for Serbs? We wanted to alleviate impaired spirit of Serbian people in togetherness and brotherhood help through humanitarian work and social aid. Who do we help? We help Serbian families who live in the Balkans, have five or more children and live in terrible poverty. Under terrible poverty we define absence of one or more basic factors required for living: food, clothes, shoes, and safe space for living. www.serbsforserbs.org 2015 Who do we need in organization? We need members and donors that will secure financial stability through supporting our programs and activities in the future. Donors may join our daily activities within the organization in order to coordinate our work better. We also need volunteers ready to donate several hours per week for actual work within the organization. Activities of volunteers and their specific tasks would be determined by the required projects and their personal interest. From that group of volunteers we would look for future leaders of organization. Why do we help? We believe that there is a basic need for one human (or a group) to help others in distress. A help is not only human virtue but also a Christian responsibility. By focusing our help on families with many children, we directly affect on their stirring toward becoming independent from socialdependable government programs. What are our long term goals? • family is ready to support itself daily and manage to pay all required expenses; • their children are encouraged to continue with school and raising their own family; • our donors are satisfied with the activities and they are ready to help other families; • our organization is satisfied with the results; • family is ready in the future to become our donor and if necessary help other families that are in need of help. Successful “Trojka iz Bloka” in Priboj was held on Sunday, June 14, at the School courts, and with the help of the Priboj Municipality and our proud sponsors, donors and technical sponsors, we raised 125,278 Dinars. Having talked with the municipality social services and local priests, who had selflessly taken the time to inform us about socially disadvantaged families, the Charity organization Serbs for Serbs decided to direct the raised funds towards building a bathroom for the Babic family from the village of Gracanica, near Priboj. Obrad Babic and his wife, Bojana, have the biggest treasure of all – four beautiful children: Andjela (12), Tamara (11), Miljan (7), and Zagorka (2). They have big plans for the future, and despite the hard living conditions, they have started building a new house. So far, they have poured the slab, and we are going to help them by building and furnishing the bathroom in their new house! www.serbsforserbs.org 2015 This close-knit family is diligent and hard-working. They live with Obrad’s father, Milan (76), in his old house in a remote part of the village, but beside the hard living conditions, they have managed to make a successful rural household. They keep eight goats, a pig and they have a field they cultivate. Apart from taking care of his sick father, Obrad does all kind of heavy physical work throughout Serbia and does not miss a chance to apply for the state subventions for agriculture and cattle breeding. They live on 9,000 Dinars of child benefit, 10,000 Dinars of the grandfather’s pension and 23,000 Dinars of Obrad’s salary. They have never received welfare! Working day and night, Obrad manages to earn some extra money to be put aside. Thus, in 2011, he started building a new house which is closer to school. The house they currently live in is more than five kilometers away from school, and the children walk there every day. They do not complain about the old house, either. They live and work there in unity and do their best, but Obrad wants his children to have a happier childhood than his own. Young host, Miljan Obrad will finish building the house on his own, as he started it. A lot of work is yet to be done: the roof, walls, windows..., but Obrad is not afraid of work. He has accepted our help with building the bathroom, because that way, he will have some extra money to invest in other parts of the house. God willing, the children will spend the next winter in their new house and it will be a lot easier for them to walk to school through big snow and cold weather, which is characteristic of this area. The public will be informed about the details of this action after the project has been finished. Our proud sponsor from Priboj, the “Dekor” company, has offered to carry out this project under the most favorable terms. Best of luck in their work! With the arrival of spring and nice weather we continued the works on the family house of the seven-member family Siljegovic from Miljakovci near Prijedor. Let us remember, during the first part of the works late last year we managed to pour the first floor slab and build a roof construction before the coming winter. In the second part we started the execution of â&#x20AC;&#x153;innerâ&#x20AC;? installation works, so we finished the first phases of plumbing and electrical installations. The first phase of plumbing includes the building of the water well and setting of inflow and outflow pipes, while the second phase will include installation of faucets and drains in the kitchen and the bathroom, as well as the complete equipment of the bathroom. During the second part of the action we spent 7.936,36 KM and together with the means from the first phase of 9.225,00 KM it makes the total amount for building the house for Siljegovics 17.161,36 KM. The first phase of the electrical installation works included the power supply to the object, installation of electricity meter and distribution of cables around the house, while the second phase includes the installation of sockets, lighting in the house etc. After the first phase the father of the family should plastering of the walls, after which the craftsmen will come back and finish all installation works. We paid both first and second phases of the works. Family Siljegovic consists of father Milivoj, mother Tanja and their five children: Tatjana (18), Vedrana (16), Jovana (14), Nevena (10) and the youngest Luka (2). Also, since mother Tanja asked us to buy them a bunk because the one in which they were sleeping fell apart, we provided a corner bearing and an armchair. That will also be used in the new house when they move in. In order to finish successfully another great project of our organization and move another family into their new home, we call upon all friends and donors of our organization to get involved into the action of collecting means according to their possibilities. www.serbsforserbs.org 2015 A time came to repay the Porec at least a little bit; to note its sufferings, to visit its people, to take a bow to hummocks of fallen honorable people. One morning, Prilep was a point we passed going away and saying goodbye, and this time it was the other way around. Rays of morning sunshine in July, flashing before our eyes, reminded us of those in February, when going away from Skopje, we were enjoying the view and curiously observing paths on the landscape of the western part of Macedonia. This time, heading towards this region, we took a roundabout way, over Veles, Pletvare and the town below Marko’s towers – Prilep. The course of historical events and circumstances of our people is the inevitable subject and once again we became aware of our own ignorance. This story reflects the fate of our people. After the financial donation of the Charity organization Serbs for Serbs from Belgrade, the aid was delivered to the Krstevski family from the village of Latovo, Makedonski Brod Municipality, in the Porec region in the western part of FYR Macedonia. The previous action of the Charity organization Serbs for Serbs had comprised Kumanovo and Skopje, Skopska Crna Gora and Kuceviste, in which three Serbian familes had been visited and helped – Perovic, Gluskin and Bravo. Thanks to the selfless zeal of the guys from Kumanovo, Velickovic and Stanojevic, and the logistics and field research of the Cultural Informative Center, Spona, we discovered the long-forgotten Porec region, the so called little Sumadija, the sidelined region of Serbian progeny, where we found the Krstevski family. They were provided with humanitarian aid, consisting of a water heater and a gas stove, worth 14,000 Denars altogether. The story about Serbs from Porec, and the little known Porec region, engrossed the hard-working Zoran and Nenad, who got on the road to buy and transport necessities to the house of the hard-working householder, Sasa. Approaching the Treska river channel was an amazing sight for the guys from Kumanovo. This western part of the Porec, which borders the central part of the country, also borders on the river Treska in the valley and it got its name by the word river channel (porecje in Macedonian). The territory of the Latovo village still gives the intoxicating feeling of peace. We are no longer ignorant of the story about the famous Duke Micko Krstic (1855 – 1909), because we hear it again from Saso Krstevski, the descendant of the Duke. We say a few more words, and then we go inside to take a rest. Hard working Saso and his household members can now ease their troubles. His three children, Hristina (16), Saska (15), and Borce (7) were curiously observing the guests and appliances. We were heartily welcomed with coffee, made on a wood-burning stove. We talked about the neighborhood, the village of Rusjaci, Brod and many other things. The Charity organization SERBS FOR SERBS calls upon all friends and donors of the organization to join our fundraising action to help this family and other socially disadvantaged Serbian families with multiple children. CHILDREN ARE OUR FUTURE! Friends from the Diocesan charity organization â&#x20AC;&#x153;Majka devet Jugovicaâ&#x20AC;? from Gracanica, which has worked in cooperation with the Charity organization Serbs for Serbs for years on helping our most vulnerable people in Kosovo and Metohija, have sent us the latest photos showing the work on reconstruction and fitting out the stable for breeding dairy cows in the municipality of Novo Brdo, which started in June. The Charity organization Serbs for Serbs has supported this project with 715,000 Dinars. You can take a look at the photos showing the ongoing work. The Charity organization SERBS FOR SERBS will continue to promote and support new self-sustainable economic projects in Kosmet and also throughout the Balkans, with the aim of sustainable economic survival of the Serbian people at their ancestral homes. 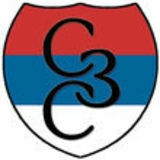 The Charity organization SERBS FOR SERBS would also like to appeal to all state institutions, public and private companies, and other related charity associations to SUPPORT FUTURE PROJECTS of our organization, which will contribute to a better and more secure future for the Serbian people, especially socially disadvantaged families and their offspring. www.serbsforserbs.org 2015 The Perovics whom everyone in the biggest village in Cacak is praising, have worked for a wage for years in order to collect the money to build a barn, despite the fact they are living in a house built in 1860. As they emphasize, the cattle is providing them the food, and since our first encounter they pointed out they needed to transfer the cows from the old barn which could collapse as soon as possible. Charity organization Serbs for Serbs helped during the summer the Perovic family from the village Ostra near Cacak in buying the material for building a barn in the value of 177.273 dinars. The special donation for Perovics arrived from the Canadian branch of the Charity organization Serbs for Serbs during the big Christmas campaign IN TIME FOR BOZIC. Monthly Report for July Charity organization Serbs for Serbs provided the material the Perovics didnâ&#x20AC;&#x2122;t manage to buy, including the iron and lumber (the details can be checked in the bills) and thus helped the family to finally build a new barn. www.serbsforserbs.org 2015 Family Perovic consists of father Miomir, mother Milka and three sons: Zoran (35), Vlade (37) and Rade (32). Three of the daughters are married: Lela (38), Zorica (28) and Vesna (26), who have three children and the fourth on the way. During the up build the craftsmen and neighbors whom the Perovics helped came to help which is saying a lot of the diligence and values of the family. www.serbsforserbs.org 2015 The entire family Naskovic is currently residing in the house of Bobanâ&#x20AC;&#x2122;s brother in one room which represents both bedroom and a kitchen, while the children are being bath in the trough alternately. Right next to the house in which they temporarily live, the Naskovics have managed with great effort to build a house for themselves. The problem consists in the fact that the house is half finished, and still not possible to live in. The representatives of the Charity organization Serbs for Serbs visited just before Vidovdan the six-member family Naskovic from the village Kusce in Kosovo Pomoravlje. Upon the initiative of the prior of the Draganac monastery Archimandrite Ilarion we found out the difficult position of this young family. The household is consisted of father Boban, mother Mikica and four minor children: Danijela (7), Teodora (3), and twins Aleksandar and Aleksandra (5 months). Except from the poverty and isolation which is an everyday occurrence of our people south of Ibar, the illness of the oldest daughter is occupying the attention of the parents. Young Danijela has a Down syndrome, but she is also faced with a greater danger. The disregard of the physicians during the eye surgery and the late information to the parents of the mistakes made are endangering the life of the cute little girl. The complications with mortal cause can occur almost every day, which makes the situation even more difficult. In order to ease the gloomy life of this young family, especially bearing in mind the difficult condition of little Danijela, Charity organization Serbs for Serbs is commencing the big action of help to the Naskovic family, with the aim to finish the house and provide elementary conditions for living, primarily for the children. Considering the fact that the social benefit and children benefit are the only sources of income for this family, we decided to conduct the project as soon as possible. The estimated value of the project is approximately 10.000 EUR. Difficult conditions for life and progress is an everyday occurrence today. However, good deeds increase the hope for better days. Our benefactors showed again how to sustain in the struggle for better tomorrow. Great friends and benefactors, Charity organization Serbs for Serbs from Belgrade recently informed us that Mr. Sasa Krsmanovic, a benefactor from Canada, wanted to help the socially disadvantaged family from the sacred Kosovo and Metohija by providing cattle. www.serbsforserbs.org 2015 Such a family wasn’t hard to find. Dalibor Dimic from Straza in the Novo Brdo Municipality is living with his wife and six children in dismal conditions. Due to their everyday struggle to sustain their children, they were immediately proposed for help. Our benefactor Mr. Sasa donated money to enable the buying of the cow for the family. The Dimic family is using public kitchen, and like in many cases the warm meal they are getting there is the only meal of the day. The cow will give them milk which is very important for the children, but the family couldn’t afford it. The cow was bought for 220.000 dinars and the happy and pleased expresses on the family members’ faces showed us we did the right thing. www.serbsforserbs.org 2015 Jadranko Milojevic is a disabled military veteran with 30% disability. For a long time, he had worked in construction and thus provided for his family as much as he could. However, recently the consequences of his injuries have begun to take momentum, and Jadranko is virtually bedridden. Doctors are very pessimistic about his chances of being able to walk sometime soon, since the required surgery is very risky and doctors do not dare to perform it for now. The only monthly income that the family has is 80 BAM that Jadranko receives for care and Dragan's salary, which is 500 BAM. In the course of July, we completed another successful action in the Republic of Srpska. This time we helped the family of a disabled military veteran, Jadranko Milojevic (50), from the village of Dragocaj, located near Banja Luka. We helped them by financing the roof construction of the family home, more precisely, the construction of another story and roof. The Milojevic family consists of the father, Jadranko, mother, Dragana (46), and their four children — daughters, Sladjana (19), Zeljana (12) and Vedrana (10), and son, Dragan (24) and his wife Jadranka (18). We owe special thanks for conducting this action to our friends from the Serbian Assembly “Bastionik”, who informed us about the Milojevic family, since they had already helped the family several times, and conducted this action on the field. The family is originally from Kljuc. However, since their house had been set on fire in the previous war, they were forced to flee and settle down in Dragočaj, where they started a new life. As Jadranko says, until he was able to work, living conditions were hard, but they somehow managed to make ends meet and even put some money aside to build a house. However, when his health got worse, the work on the house was stopped completely. Jadranko himself said that he “would not mind dying” the next day just to see the house roofed. When the construction was continued, he was so excited that, at least for a little while, he got up from the bed and oversaw the work using a cane to help him walk. The house they started building and where they are currently living was completed up to the second floor and could be used for living. However, since there was no roof, moisture found its way into the house, which particularly caused problems in autumn and winter, so it needed roofing as soon as possible. Also, as Dragan and his wife Jadranka soon expect a baby, and the Milojevic family will soon have another member, they have decided to add an extra story, so they would have enough room for everybody. The organization SERBS FOR SERBS contributed to this action by purchasing the necessary construction materials to the value of 6,871.77 BAM. We must stress that numerous friends and neighbors responded to the familyâ&#x20AC;&#x2122;s call to do the construction work, so this time there was no labor cost. Last weekend, members of the Charity organization Serbs for Serbs from Belgrade attended the celebration of the 19th anniversary of the KUD “Sveti Sava” in Graz, Austria. Hosts from the KUD “Sveti Sava” Graz gave us the opportunity to address people in the diaspora and briefly present the work of the organization. We had a pleasant time meeting people and talking to them, and we raised 820 Euros of donations for helping socially disadvantaged Serbian multiple children families. We thank everyone for the given trust, especially the friends who contacted us and hosted us in their city. On June 26, representatives of the Charity organization SERBS FOR SERBS, in cooperation with the Student Parliament of the University of Pristina with a temporary headquarters in Kosovska Mitrovica, delivered valuable humanitarian aid, worth 828,000 RSD, consisting of necessary equipment needed for the improvement of the maternity ward of the Healthcare Center in Kosovska Mitrovica. Funds for purchasing cardio-topography, dry heat sterilizers, ECG devices, monitors, scales for measuring weight and height of pregnant women, pressure gauge were provided through the sports-charity “TROJKA IZ BLOKA” project, which was held at the beginning of April in Kosovska Mitrovica. www.serbsforserbs.org 2015 Mr. Ivanovic pointed out that the aid was very valuable to them because it arrived in difficult times when the Kosovo institutions are constantly trying to impede treatment and obstruct the delivery of medication, medical supplies and equipment. “Again there were some problems with the Kosovo institutions and the Kosovo customs, but this is what they are doing all the time. They are trying to worsen the living conditions and make life here even harder, which would ultimately lead to ethnic cleansing of this area. They will stop at nothing, even when it comes to health care. All this equipment - cardio-topography, dry heat sterilizer, ECG devices, monitors - is very valuable, and I’m not surprised that we received it from this organization, because the young have always been the ones with the most positive attitude. This humanitarian action and donation proves it,” said Ivanovic, thanking them for their work and efforts they made, and, as he said, for not giving up but successfully finishing this action. Monthly Report for July General Secretary of the Charity organization Serbs for Serbs, Mladen Matijasevic, said that they did exceed the funds planned for this project in Kosovska Mitrovica, but that they made sure that the aid was primarily directed towards children. “We wanted to keep the motto: “Children are our future.” We had previously made a list of burning issues together with the head of the maternity ward, Dr. Milijana Milenkovic, and originally we had agreed on providing one piece of equipment and a delivery bed. After that, we had meetings with several organizations in Belgrade and they wanted to join the project,” he explained. Matijasevic pointed out that the “Trojka iz Bloka” Tournament, held in Kosovska Mitrovica at the beginning of April, was at a very high level and one of the biggest, together with the central tournament, which is held at Kalemegdan. Miroslav Milic, president of the Student Parliament, said that students tried to help as much as they could to make the work of one of the biggest maternity wards in Serbia easier. He appealed to everyone to make sure no more problems occur at the border crossing in the future, as was the case this time. “Holding this humanitarian shipment for so long is a disaster for everyone. We were subjected to considerable inconvenience because they did not allow us to cross the border crossing, they made all kinds of pretexts, and this poses a problem for the city of Kosovska Mitrovica,” Milic said. The Charity organization Serbs for Serbs continued with the ongoing project of collecting and donating books to various educational institutions. This time, cooperation was established with the library of “Milivoje Borovic“ Primary School in Mackat. After the organization had been addressed by the school library representative, and in cooperation with Mr. Baneta, member of the organization, and his friends, first package of about forty books needed for the school library was delivered. The project of collecting books for this primary school will be continued over the following months. The Charity organization Serbs for Serbs and one of the most popular rap groups in Serbia, THC La Familija, were the organizers of the second in a row sports-charity spectacle under the name of Trojka iz Bloka – Familija for Serbia! In the neighborhood of Neimar, in the heart of the Old Town, these young rappers with a big heart showed there is hope for all socially disadvantaged multiple children families throughout Serbia and the Balkans. Good will and great energy were all they needed to gather over five hundred people, their closest neighbors and admirers, and even 110 of them entered for shooting 3-pointers! The Tournament raised 70,140 Dinars! The atmosphere was fantastic from the very start of the tournament, which was opened with the winning, sports anthem of the entire Serbia – Igraj i pobedi (Play and win). Bore and Stefan performed their hit for people gathered at the basketball court and the spectacle could officially start! On this occasion, the graffiti - Igraj i pobedi - was displayed, which the popular rappers dedicated to all generations of basketball lovers. Charming hip-pop kings: Bore and Stefan Support to the second in a row tournament just kept coming. Model, Ivana Korab, supported the tournament in a short video announcement that she had recorded few days prior to the tournament, and she won the hearts of everybody present in Neimar with her beauty and charm. Football player, Vujadin Savic, also came and supported the work of the Charity organization Serbs for Serbs and the sports-charity “Trojka iz Bloka“ – Familija for Serbia project. During the break before the finals, hip-hop dancer, Ivana Sugar, showed her skills in street dance, and brothers of the Charity organization Serbs for Serbs, kick-boxers from the club “Pobednik,“ demonstrated their skills to the gathered and got a big round of applause. The icing on the cake was a big friend of the “Trojka iz Bloka“ – the best European Basketball Freestyler, Nemanja Tricky Blazic, who performed his magic with a ball and in a humorous way set up a showdown with Stefan from THC La Familija. As always at the tournaments, DJ of THC La Familija and the official DJ of the “Trojka iz Bloka,“ Sale L, created a great atmosphere by carefully choosing foreign and domestic hits and, being charming as he is, entertained all spectators, contestants and neighbors. In Neimar, 3-pointers were also shot by brother Skabo, who has been supporting the “Trojka iz Bloka” project from the very start. The winning spirit: kick-boxing club “Pobednik“ Only our fellow townspeople failed to attend the Familija for Serbia Tournament – there were guests from all over the world. Denny, from Houston, America was with us, Sedrick came from Mauritius, Simeon from Dusseldorf, and Slavko from Linz. People from all parts of Serbia also came to support the noble mission of the “Trojka iz Bloka“! The boutique stand of the Charity organization “Serbs for Serbs“ was set up beside the basketball court, as well as the stand of our proud sponsor “Agi Pasta Away“, fast food pasta chain, where people could try delicious pasta, and all the money they made was added to the total amount raised at the Tournament. Support given by two legged and four legged friends: brother Skabo with wolves Only our fellow townspeople failed to attend the Familija for Serbia Tournament – there were guests from all over the world. Denny, from Houston, America was with us, Sedrick came from Mauritius, Simeon from Dusseldorf, and Slavko from Linz. People from all parts of Serbia also came to support the noble mission of the “Trojka iz Bloka“! The boutique stand of the Charity organization “Serbs for Serbs“ was set up beside the basketball court, as well as the stand of our proud sponsor “Agi Pasta Away“, fast food pasta chain, where people could try delicious pasta, and all the money they made was added to the total amount raised at the Tournament. The magic of the “Trojka iz Bloka” once again gathered seemingly distant people and different interests and turned all that into a holiday of sports, humaneness and fun! The best shooters at the Tournament in Neimar were: Aleksandar Jecmenica, first place, gold medal and the “Trojka iz Bloka“ trophy, Paja the Chef Sretkovic, second place and silver medal, and Aleksandar Djuric, third place and bronze medal. We would like to congratulate the best, and we would also like to congratulate and thank all people who came and supported the second in a row Familija for Serbia Tournament! Great interest people showed in the tournament was justified by the guys from THC La Familija, who made another perfect tournament! The media was also there to support the action in their own way and send this beautiful picture for the world to see: Morning show of Pink Television, photo reporter of a Sports magazine and one of the most popular internet shows in Serbia – iDJ Hot, in production of iDJ videos. The Charity organization Serbs for Serbs would like to thank proud sponsors, donors and technical sponsors, as well as volunteers, who are all together part of the big â&#x20AC;&#x153;Trojka iz Blokaâ&#x20AC;? family! Familija for Serbia is another proof of the quality of the idea and mission of the tournament! On Sunday July 12 on the great feast of Holy Apostles Peter and Paul we held successful “Trojka iz bloka” in Banatski Karlovac. The slava of this peaceful place in Southern Banat was marked this year by the cheerful sport-charity manifestation on the field near the stadium. Many people, from the youngest to the oldest, gathered to see the magic of “Trojka iz bloka”. The devotion of Alibunar Municipality and Local Community Banatski Karlovac, as well as the popular rap group THC La Familija in cooperation with the Charity organization Serbs for Serbs led to the fulfillment of another major step towards the goal of “Trojka iz bloka”. Over eighty contestants applied for shooting threepointers and we collected 24.870 dinars which would be used for helping the multiple children socially disadvantaged family from Southern Banat! www.serbsforserbs.org 2015 We also expect the donations from the Alibunar Municipality and many businessmen from this area, which shows that the idea and mission of the tournament are well excepted and helped from the most respectable places! Great number of people on the field showed they cared about their neighbors and that they are aware they can help them! Young and talented Jasmina Pavlovic, member of the KUD “Dobrica Milutinovic” solemnly performed the anthem of the Republic of Serbia “God of Justice” and thus opened the tournament. After that, Mr. Milos Simovic from the Charity organization Serbs for Serbs addressed the gathered, as well as Petar Radulovic, president of the Council of the Local Community Banatski Karlovac, who thanked his fellow citizens for coming in a great number to support the tournament, but also to Charity organization Serbs for Serbs and the rap group THC La Familija who decided to extol the slava of this beautiful place with cheerful manifestation, and enrich the life of everyone in Banatski Karlovac with good intentions. “There are people and good deeds” – said Petar. Prior to the beginning of the tournament, members of the KUD “Dobrica Milutinovic” showed by dancing and singing how to celebrate slava. Their appearance made everyone present smile, and reminded them of the most beautiful heritage of the Serbian tradition. www.serbsforserbs.org 2015 After them, a great friend of the tournament “Trojka iz bloka”, seminarian, rapper and a humanitarian Uncle Dzo performed, and reminded the present of the great goalkeeper of the Red Star Zvonko Milojevic with his hit “Win Miloje”. The DJ of THC La Familija and official DJ of “Trojka iz bloka” Sale L provided top fun for everyone. The best shooters on the tournament were Filip Filipovic who won the first place with 21 three pointers, Nikola Hocevar with 16 shots was on the second place, and a lady Snezana Zekic won the third place with 11 shots, thus defending the honor of the ladies. We congratulate the best, and to all who attended and exalted this solemn day for all of us! www.serbsforserbs.org 2015 The oldest inhabitants couldn’t hide their gratitude and enthusiasm due to our tournament. They came to support, have fun with the young, try some of the specialties, and to see and feel the magic of “Trojka iz bloka”! The tournament commenced when the official DJ of “Trojka iz bloka” Sale L played the anthem “God of Justice”. Everyone stood up and turned towards the flag which was hanging on the basketball field. Afterwards the gathered crowd was addressed by Mladen Matijasevic before the Charity organization Serbs for Serbs and Mr. Branko Latkovic before the Local Community Kupinik. On Sunday July 19 2015 the southern Banat showed that it bears for a reason a nickname “the heart of a hero”. The second half of the tournament in fast shooting of three-pointer “Trojka iz bloka” was successfully finished in Kupinik – the village of 130 permanent residents gathered over 200 people on the field, it had 70 participants applied and collected 64.410 dinars! The rule that the biggest pearl lies in the smallest shell can be applied to Kupnik – one of the smallest villages in Vojvodina and one of the poorest municipalities in Serbia collected more money than far bigger and wealthier towns we visited! The energy on the tournament in Kupinik was intensified by the fact that the last gathering was organized 12 years ago on the occasion of the village slava of Nativity. Entire Kupinik engaged for this “Trojka iz bloka”. Everyone contributed a little and we gained a lot – from the support of the City of Vrsac and Plandiste Municipality to the local associations and businessmen. The Hunting Association “Jastreb” prepared extraordinary venison stew, the Fishery Association “Grgec” fish stew, the “Krajina” tavern provided electricity, tables, plates, parasols and other necessary items, the “Moja voda”factory from Vrsac donated bottled water, nice women from Kupinik made cookies that smelled wonderfully, and the “Maslacak” store donated refreshments for the gathered crowd. All the products were for sale, and people would place the money in the charity box of the Charity organization Serbs for Serbs. The “Antena” Radio was calling for days prior to the tournament people to come and join the noble mission of “Trojka iz bloka” which in Kupinik consists of renovating the local medical center! Thank God, there are no socially disadvantaged multiple families in this village, so we decided to renovate the medical center, which would mean the most to children who are our future, but also to the oldest who are our glorious and honorable past! www.serbsforserbs.org 2015 They started in the Neimar Park in their area in Belgrade, where thanks to the friends and neighbors we “made a show” as they like to call it. Banatski Karlovac on the feast of Holy Apostles Peter and Paul where Stefan’s ancestors are from followed, and it finished in Kupinik where Bore’s family is from. Big family of “Trojka iz bloka” became bigger with these two wonderful places in southern Banat. Bore and Stefan, and Sale L with their energy, effort and selfless dedication made three perfect tournaments and showed everyone how much their family and the mission of “Trojka iz bloka” means to them. They provided space, support, music and verses, and it all came back to them in multiple ways. They also performed in Kupinik with their hit – the anthem of the sport representations of Serbia – Play and Win. As always, young seminarian, rapper and a humanitarian Uncle Dzo was with them, and he brought back the gathered people into distant times by reminding them of the legendary goalkeeper of the Red Star Miloje with his hit “Win Miloje”. Another song performed by Uncle Dzo was a touching song about the hero of the Serbian aviation Colonel Milenko Pavlovic who was boldly killed in the unequal struggle against the criminal NATO aggressor in 1999. Our brethren and friends from one of the most popular rap groups in Serbia THC La Familija really tried and performed three spectacles during the last three weeks. www.serbsforserbs.org 2015 Both the first and the second tournament in southern Banat were perfectly organized! We collected in total over 140.000 dinars in both tournaments. The great heart of southern Banat, heroic and fraternal! These two places will remain in the best memory, as well as the desire to see each other again next year. It is almost sure! Until then, you can enjoy in the photos at our photo gallery “Trojka iz bloka”. The best shooters at the tournament in Kupinik were Ivan Postin – first place (won the trophy “Trojka iz bloka” and a gold medal), the second place and a silver medal went to Nemanja Borozan and the third place and bronze went to Mr. Branko Latkovic, one of the most responsible for the organization of the tournament. NUMBER OF DONORS IN 2015. Serbs for Serbs Report July 2015.